Mouse Away Solids are an all-natural, non-toxic and effective mouse repellent that helps you get rid of mice for good (without hurting them OR you)! Got mice in your house, nesting in your car engine or taking up residence in your RV? 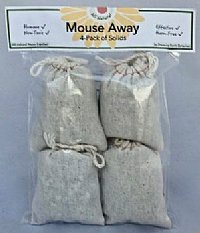 Try our easy and all-natural Mouse Away pouches to get rid of them and keep them from coming back. 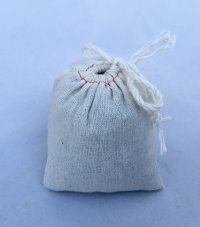 The Mouse Away Solid pouches are small cloth bags filled with about four ounces of an inert material infused with Mouse Away Concentrate, our custom blend of spearmint and peppermint essential oils. Just toss the pouches under cabinets, into basement corners, into attics, cars, garages, etc. The pouches are especially useful in keeping mice from nesting between the inner and outer walls of hot tubs. 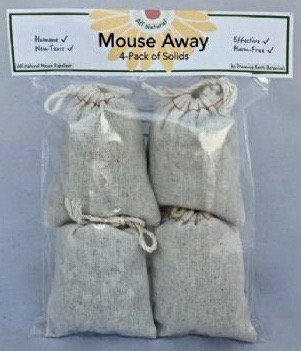 Each pack contains four individual Mouse Away Solids, our all-natural Mouse Repellent made from a blend of pure Peppermint and Spearmint Essential Oils. Mouse Away Solids do not harm rodents at all! Rodents simply hate the smell of Mouse Away and move away ASAP. The essential oils of Peppermint and Spearmint smell so wonderful that it seems almost a shame to use them for chasing away mice and other rodents, but Mouse Away Solids work. For maximum effectiveness, use our Mouse Away Concentrate to "recharge" the pouches every few months. Please note that we don't recommend Mouse Away for use outside. There's too much ventilation and the oils will evaporate too quickly to be effective. Mouse Away Solids are also available in bulk sizes. Note: For very bad infestations, it is best to use our non-lethal Mouse Cubes humane mouse traps to trap as many as possible first. To learn more about how to use Mouse Away, including how to use them to get rid of mice in your car, click on How to Get Rid of Mice or call us to talk about your specific situation (1-800-897-8330). Getting rid of mice isn't easy-- let us help! To see our full list of natural pest control products, click here. "Mouse away solids 4 pack"
Review: the Mouse Away Solids work. Should have ordered 150 the first time I ordered from you. thank you so much. Have a great day! Review: Finally, something that really works! I had one mouse I just couldn't get rid of and the scent of the oils has sent him back outside! I couldn't be happier! My daughter and I love the smell!